For McCann, the founder and CEO of the world’s leading florist, 1-800-Flowers.com, being open and ready to speak to a variety of audiences is his most powerful leadership tool. In Talk Is (Not!) Cheap, McCann illustrates how the art of conversation leadership — the process he developed to engage others and create forward momentum in the workplace — can be used to inspire, innovate, and win. Using a blend of how-to and insightful personal stories, this audiobook argues that the gift of gab may just be the most critical (and undervalued) skill set in today’s workplace. Lessons include how to overcome hesitation when diving into conversation with strangers and knowing when to just “shut up and listen!” McCann’s practical advice comes from twenty years of experience as the voice of small business, and from meeting and exchanging ideas with other influential business leaders around the world. Whether you’re interacting with customers, pitching new business to a client, or seeking to be heard within your own company, Talk Is (Not!) 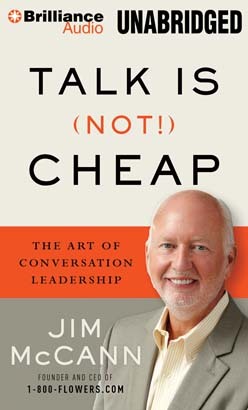 Cheap will strategically transform the way you communicate and listen. With McCann as your guide, this important audiobook will teach you how the art of conversation leadership can improve and joyously change your life.